It’s a way of measuring the total amount of air in your lungs, and how much air is left after you have breathed out as far as you can. If you have an obstructive lung condition, there is a narrowing of the airways inside your lungs. Your lungs never empty of air completely and more air stays in your lungs than normal after you breathe out. Examples of obstructive conditions are COPD, asthma and bronchiectasis. If you have a restrictive lung condition, you cannot fill your lungs fully with air because your lungs are restricted from expanding fully. This is because your lungs have lost their elasticity. Examples of restrictive conditions are pulmonary fibrosis and sarcoidosis. Sometimes this may also be seen in people who have a curvature of the spine or changes to shape of their ribcage. To measure your lung volume you will sit in a sealed, clear box with a clip on your nose to make sure that no air escapes from your nose. Changes in pressure inside the box help to determine your lung volume. People sometimes worry that they will have to sit in a box. 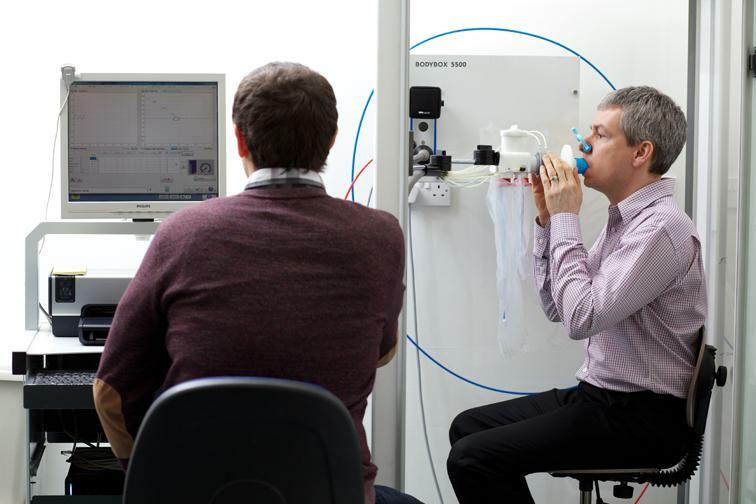 You’ll be able to talk to the lung physiologist performing the test throughout. Let them know if you are anxious. The tests only takes about 5 minutes. During the test you will be asked to pant or breath quickly for a couple of seconds. You will also be asked to put your hands firmly onto your cheeks to stop them puffing in and out. You will then breathe in and out using a mouthpiece for a short time. The method used to measure lung volumes may vary depending on your condition or the equipment that is available at your hospital. Your lung volume results will be compared to the results for others of your age, height, gender and ethnicity. If they fall outside of the normal range, this may suggest obstruction or restriction. In people with COPD, if the tests show that there is a lot of trapped gas it may mean that you are suitable for a lung volume reduction treatment. Ask your doctor about this.